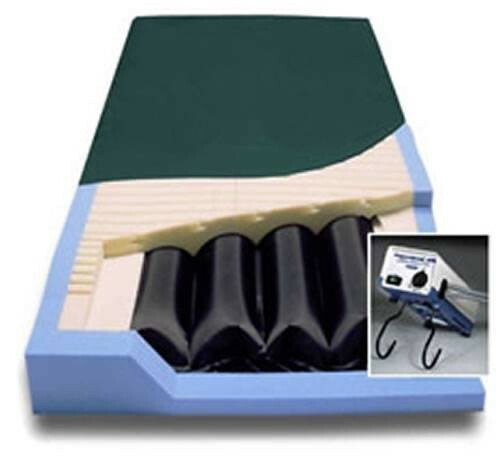 Unlike other alternating pressure mattresses, the PressureGuard APM won't create extreme pressure gradients between inflated and deflated cylinders. On top, the Geo-Matt anti-shearing surface forms a comfortable, therapeutic interface between the air system and the user. It absorbs and smoothes sharp pressure drop-offs that other surfaces can't, while the air system does the heavy lifting below, alternating weightbearing across the surface in ten minute cycles. 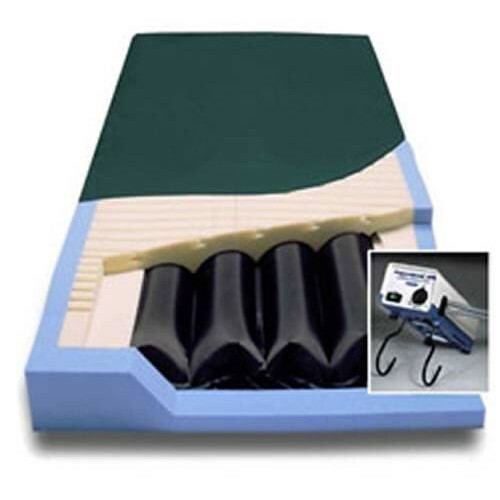 Other standard PressureGuard features include the exclusive Heel Slope taper, and two-part bolster system for added stability when sitting or transferring. Weight limit 350 lbs. Mattress weight 20 lbs. Pump weight 5.25 lbs. 18 month warranty. UL listed. Please consult the Braden Scale for Predicting Pressure Sore and Risk©. The Braden Scale for Predicting Pressure Sore Risk© is a clinically validated tool that allows nurses and other health care providers to reliably score a patient/client's level of risk for developing pressure ulcers. Assists nurses with varied experience and judgment to consistently identify patients at risk and to quantify the severity of risk. Reminds busy nursing staff to attend to this aspect of patient assessment and care with the consistency necessary to influence outcomes. Directs the attention of the nurse to six specific risk factors so that preventive care can be appropriately prescribed. The Braden Scale is a summated rating scale made up of six subscales scored from 1-3 or 4, for total scores that range from 6-23. The subscales measure functional capabilities of the patient that contribute to either higher intensity and duration of pressure or lower tissue tolerance for pressure. A lower Braden Scale Score indicates lower levels of functioning and, therefore, higher levers of risk for pressure ulcer development. Basic protocols based on Braden Scale scores are provided. The intensity of the preventive interventions being recommended increase as the level of risk rises. These protocols are easily understood by staff and, if they are consistently followed, have been found to reduce the incidence of pressure ulcers. The Skin Assessment Tool© is a useful instrument for assessment of the skin surface for lesions. It directs the caregiver to systematically evaluate 29 of the most common sites of pressure ulcer occurrence. A head-to-toe assessment of skin condition should be conducted daily for at-risk patients. My father has to recline at a 45 degree angle in his hospital bed. As a result, his buttocks have created a crater in both of his gel pad mattress overlays at the point where his bed inclines. Will this air mattress solve this issue, or do you recommend another one? Is this mattress flame resistant? The mattress is flame retardant. I AM SO PLEASED WITH THIS MATTRESS. IT IS VERY COMFORTABLE WHETHER I'M LYING ON MY SIDE OR SITTING UP. MY PRESSURE SPOTS ARE DIMINISHING NICELY. I HIGHLY RECOMMEND THIS MATTRESS.